I had on hand some cooked lentils so I thought I would try pairing those with a massaged kale salad. I wanted to "beef" up the protein so I added tofu to the mix and decided to go with quinoa for additional protein and staying power. Plus, quinoa is super fast to cook if you don't already have some made up and on hand. Since I finally got over my massaged kale phobia, I've been making it more frequently with lemon juice and sea salt. But I love the idea of a creamy dressing as well, and thought it would go nicely with this type of salad so I made up some lemony tahini dressing. I wish I could be super creative with a fun, catchy name. But, well, I'm not. 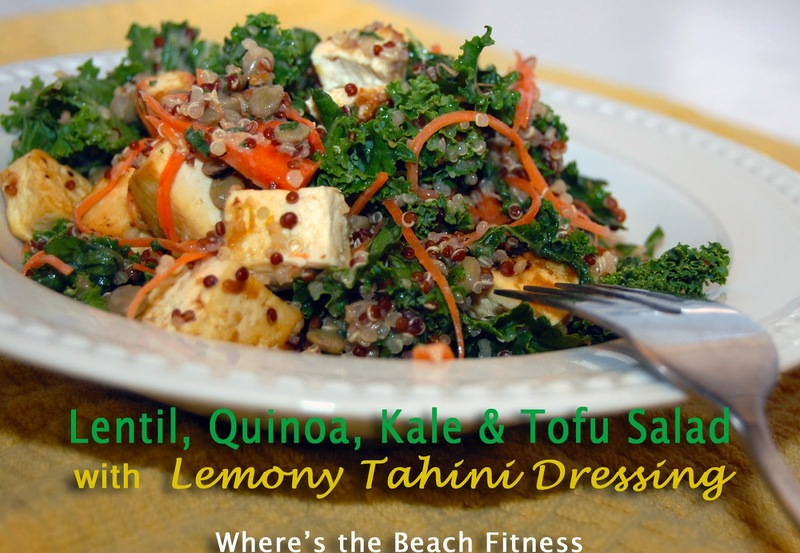 So I'm calling this one as it is: Lentil, Quinoa, Kale & Tofu Salad with Lemony Tahini Dressing. In a large bowl massage kale with juice of 1/2 - 1 lemon (depending on size) with salt, set aside for approximately 10-15 minutes. In a small bowl, whisk together lemon zest, remaining lemon juice, orange juice, tahini, olive oil, pinch of salt, agave, and parsley and set aside. Use part of the dressing as a marinade for the tofu allowing it to marinate 30 minutes or longer. Bake tofu at 400 degrees for approximately 20 minutes, flip and continue to bake until brown and firm. Then cube into bite-sized pieces after it has cooled. Meanwhile, pour the rest of the dressing over the kale, adding in the carrots, lentils, and quinoa. Re-season if needed. Once the tofu has cooled, add to the salad and toss gently. This turned out maybe better than I had expected actually. Jason was actually quite impressed with it as well. Let's just say there were no leftovers to be had.